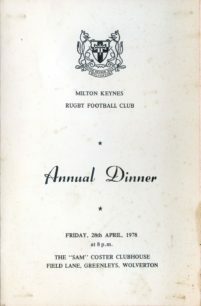 A digital archive of photos, press cuttings and memorabilia that have been collected by Milton Keynes Rugby Union Football Club and are used in annual albums or photographic displays at their clubhouse. 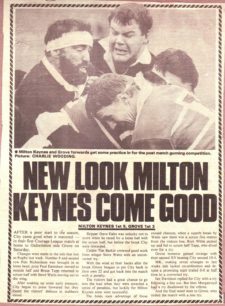 A selection of press cuttings and memorabilia from the Milton Keynes Rugby Club’s 1980-81 album (01). 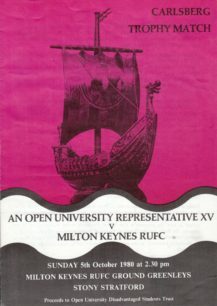 A selection of digital copies of press cuttings and memorabilia from the Milton Keynes Rugby Club’s 1981-82 album (02). 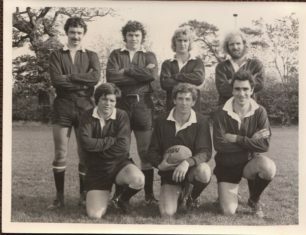 Digital copies of four black and white photographs of the New City Sevens team at matches during the 1976-77 season. These photos are displayed at MKRUFC club house on a board. 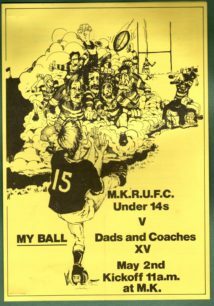 Miscellaneous team photos and photos of objects related to Milton Keynes Rugby Club. Digital copies of team photographs, action photographs, individual player photographs, sponsored rugby balls and the ‘MK Pint’ tankard. Also a photo of a T-shirt. 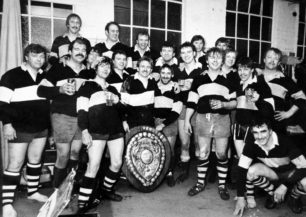 Group: Miscellaneous team photos and photos of objects related to Milton Keynes Rugby Club.